Discussion in 'Mapping & Navigation' started by drneo, Nov 3, 2018. 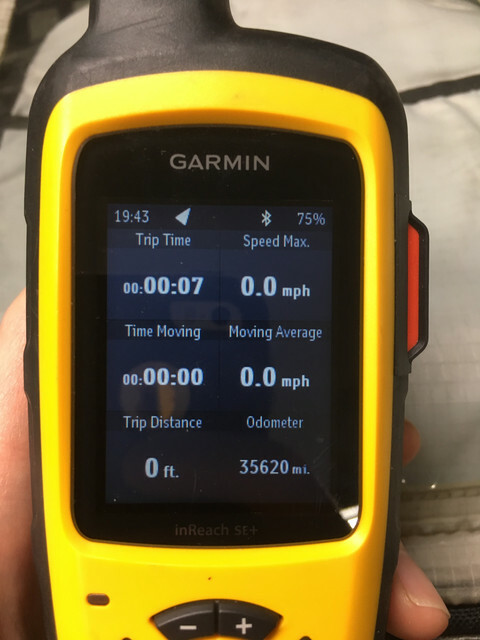 Over the the last 7 months and ~30,000 miles, I have been using the using the Garmin inReach SE+ to document my attempt at riding every single highway in Minnesota. You can check out my progress here! I have also used the device to document/certify an Eggsanity Silver, a Border 2 Border ride, plus the Piston Diversity series of rides. After all of those miles, I thought I’d share some feedback! I have the inReach SE+ which is about the size of a “normal” handheld GPS unit. Gamin makes two different versions that have the same footprint. They also make a Mini version that’s about half the size of the SE+/Explorer. The difference between the SE and the Explorer is that my unit does not have any integrated maps. You just get a breadcrumb trail. This wasn’t important to me as I’m going to primarily be using this on my motorcycle, and not hiking. 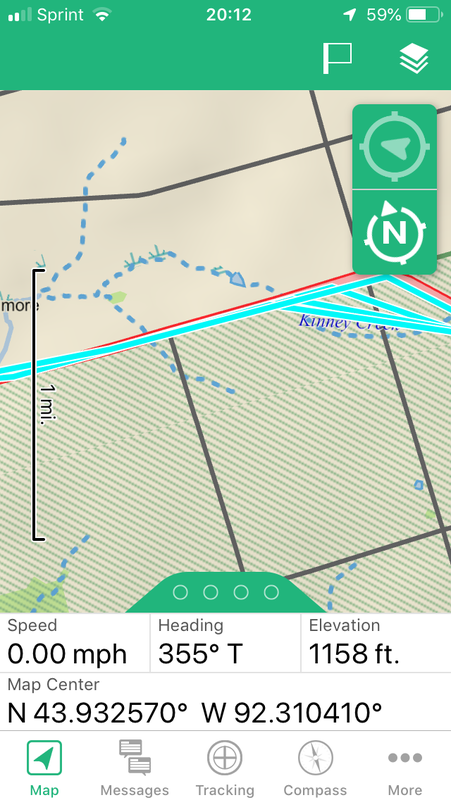 Because it connects via Bluetooth to my phone, I can always use Garmin’s free Earthmate app for topo maps if I decide to head off on foot. The device came with a strap, manual, and charging cable.The device is rated as IPX7 water resistant, so it doesn’t mind getting rained on or going for a short swim. The screen is bright enough to see in direct sunlight and has buttons that are easy enough to use with gloves on. Setup of both the device and the online account were simple, I didn’t even have to go outside for it to capture the required GPS signal! I opted for the “Freedom Recreation Plan,” which allows me to “pause” the subscription throughout the year if I’m not using it. I did a detailed write up of the pros/cons of each plan here. With all of the taxes and fees, it works out to $37.26 per month. The Freedom Recreation Plan (FRP) sends up a location every 10 minutes, creating a breadcrumb trail. My inReach has a specific URL that is associated with my device, which I can send to anyone that would like to follow my progress. I can also choose to upload this to Facebook/Twitter/etc. The FRP also allows me to send and receive 3 different preset messages for free (as many times as I’d like too). I have chosen “Starting ride,” “Gas/Rest stop,” and “Ending ride” as my 3 presets. (I chose these presets because I was really only using the device to certify IBA rides and my Minnesota project.) You can change these preset messages easily on the app or the website. Each time I send a preset message, a small icon appears on my map on the location, plus an email gets sent to whomever I’d like (in this case, to my wife). Contained in the email are my current location, the preset message (Gas/Rest stop) and a link to the map page. The inReach also feeds my Spotwalla page, so I can submit documentation to the IBA easily. 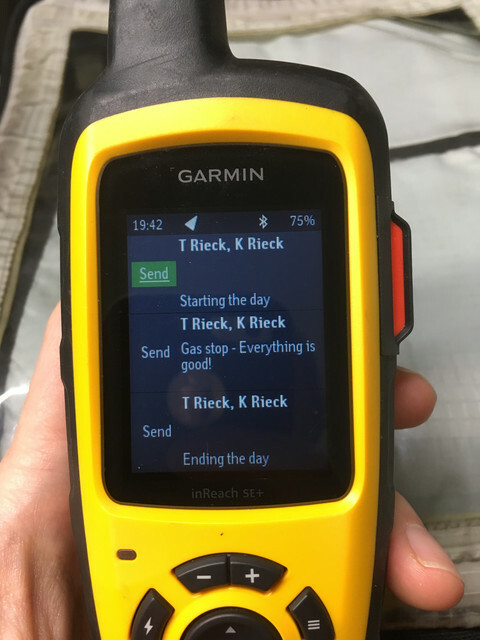 The inReach also allows you to send custom messages too. The on-device keyboard does take a while, but you can link up your phone (via Bluetooth) to the device and type faster. 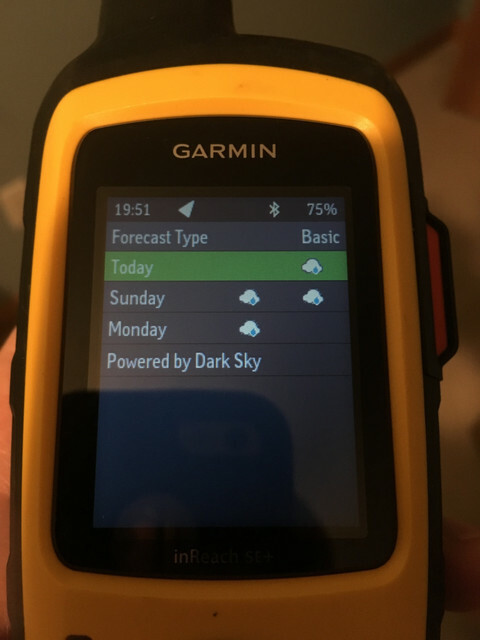 You can also use just your phone and the Garmin app to do just about everything (including triggering SOS) without having to touch the device at all! This gives you a peek at what the online map looks like. On the left is a recent track that I've highlighted. I generally ride with the device in my tank bag or in my top case. Neither of the locations impede the device from sending info or location updates. I can actually push/pull messages from inside my finished, insulated garage. I have updated the device several times, just use the included USB port and jump on Garmin’s website. You will need to update the device if you make any changes such as preset message info. Since the device operates outside of a cellular network, I trigger emergency services nearly anywhere should the need arise. Luckily, I haven’t had the needed, but it is nice to know that I can. 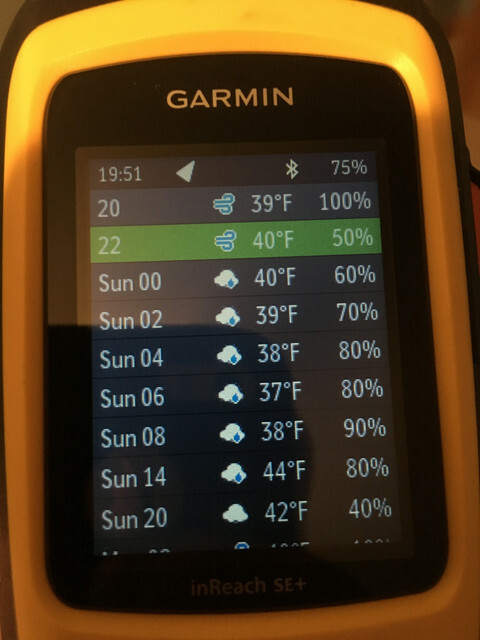 You can actually use the device to pull weather data for your current location or other locations. You can access basically everything that is on the device right from your phone. 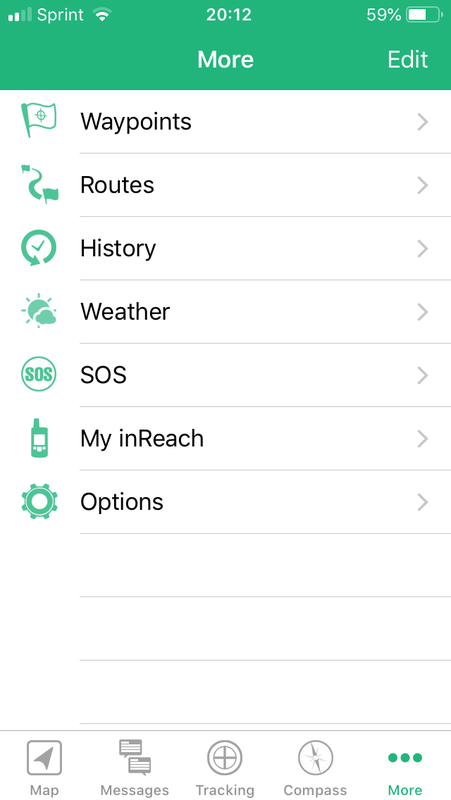 Routes, maps, tracking on/off, messages (both preset and custom), digital compass, weather, history, trigger SOS, it's all there. The maps are highly detailed and you can download multiple regions if you travel outside of North America. Battery life has been amazing so far, generally I can get 3 days of 14 hours of riding out of the device before it drops below 20%. Under 20% the device will warn you that the battery is getting low and you should charge in case you need to trigger an emergency. A typical 16-hour SS1000 saw a drop of ~15-20%. Charging is easy as the device uses a micro USB cord. Garmin does have a powered RAM-compatible mount, but I haven’t found it necessary. When I purchased the inReach, Spot had yet to come out with their latest version that has the ability to connect to a phone to send/receive messages. Being able to use two-way messaging with first responders to relay information about the situation really sold me on the device over Spot. Being able to say who/what/where/how intense with emergency responders can save a lot time and possibly someone’s life. I have also heard some horror stories with Spot about responding (or lack there of) to emergencies. The device itself has been great and the service has been stellar so far too. The website has slowly gotten better as the months have dragged on. Originally I had a tough time loading the maps and clicking on other areas of the website would continually prompt me to change my password. I thought that it was my computer or my web browser, but I got the same thing on other devices. This seems to have resolved itself over the past 4 weeks or so. 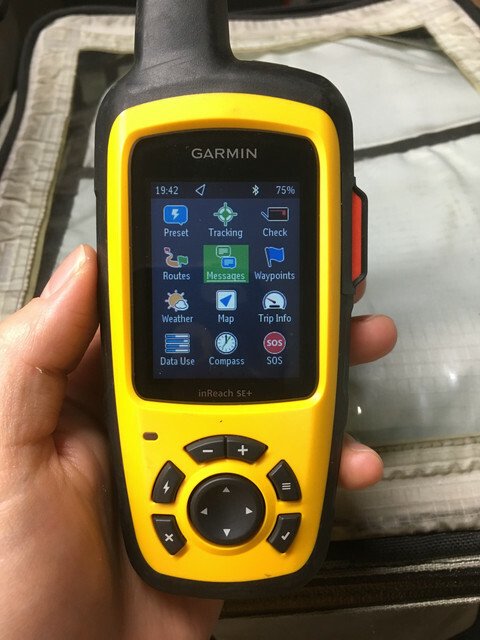 I’m sure there were some growing pains as inReach transitioned over to Garmin from Deloreme. Thanks for reading! Feel free to ask any questions, I’ll do my best to answer them! jamesmc, outdoorsman, Dan Diego and 4 others like this. Agreed - I'll change it for clarity. Thanks! Saw that a European company, ProteGear, offers subscription plans for the inReach. Nothing comes up in an ADV search. Looks to be more flexible, and possible less costly, depending. Anyone have any experience with this company? Or an other-than-Garmin source? You can share your location with friends and family on a web based browser password protected page. Send them a link and off you go. On that page is a tool where they can message you. The message goes to the device/ (and phone) if you have it paired. Sadly, I was in the middle of no-where (SE Oregon) when a message came in telling me of a sister passing and for me to get home to tell mom. I raced to the nearest regional airport 250 miles away to connect to Seattle (last plane out) and then Vancouver BC (last plane out). I texted a friend to find me flights, and a mini storage near the regional airport-when I stopped for gas I received the address for the mini storage. So- messaging out is important, but also the messaging in, equally important. Next- you are able to upload a track to the device. Then, use the Garmin app with maps on your phone to see your current location with the map.. This is Especially helpful in the backwoods for navigating. The usefullness of touchscreen smartphone map adjustments for zooming with having the track and your real time location shown is a much better experience than the Nav5/6 where you can barely discern track lines in the sun on the Nav5/6. Use it in this context merely to see if your on the intended track. This is very helpful, thanks! I am new to motorcycle touring (I haven’t yet!) and safety/communication is a big concern. I’ll look into this. Bought the inReach Explorer+ at home in Canada not too long back. I now have it offshore with me in the North Sea, UK, on a ship, testing its features out as if I was on a long bike trip. I am on a long trip... just not on the bike, but definitely well out of the reach of any cellular services. Sent and received some messages (to and from my wife in Canada) and going to plot the vessel route for a bit as well. I guess that's one way to test the unit :) Thanks for the write up above and comments after. Proved useful. drneo and Chaostrophy like this. Further to my comments above. I have now experienced that the iReach Explorer+ works well in combination with the IOS Earthmate app. When the inReach is on, and paired with my iPhone via bluetooth, it's easy to write/read/send/receive emailed messages on my iPhone 10R (using the Earthmate app) without having to result to the clunky non-touch screen text entry method on the iReach. At a pinch though (no iPhone/Android device) you could easily write a message using the inReach text entry method, it would just take a lot longer. A touch screen (+larger screen) on the inReach would be on my wish list. Bluetooth connection is reliable and instant when I power the inReach Explorer+ up near my bluetooth enabled iPhone. 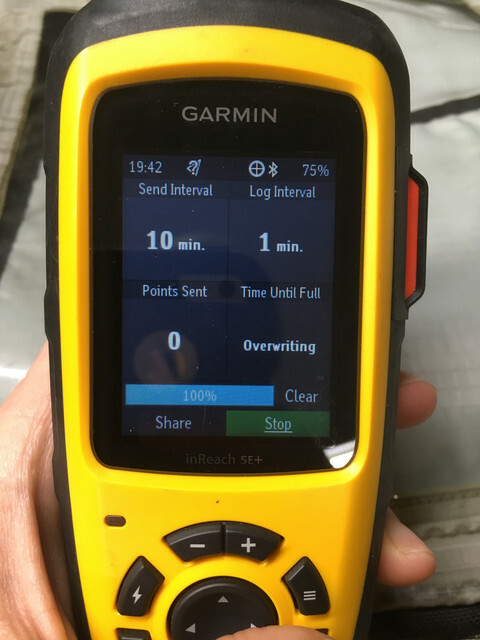 Both units (inReach/iPhone) seamlessly synchronise with each other when they are connected via bluetooth and, with me about 170km offshore in the North Sea, UK, the send receive function works well via satellite. Nowhere as quick as normal email or text messages. However, if you are in the middle of nowhere, any messaging system that works reliably in remote locations is golden. drneo and ohgood like this.